Will My Insurance Pay For Drug Treatment? When it comes time to enter into a drug rehab program or alcohol treatment center, one major consideration is how to pay. There are many available options including loans, payment plans, and private pay, however, the most common form of payment is health insurance. If you want to use your insurance to pay for drug rehab you may have lots of question. It’s not always clear what kind of treatment is covered and what out of pocket costs you might incur. In most cases speaking directly to the admissions team should be your first step. To assist you in better understanding your treatment options when using your health insurance, here is a quick guide to get you started. Start by finding the contact information for the facility you plan to attend. Usually, this can be found on their website as well as social media accounts. Royal Life Centers admissions department is available 24/7 at (877)-RECOVERY and offers benefit verification at no charge. Once you make the call, there are some important questions you should ask in regards to your level of coverage. Does my insurance cover drug detox, inpatient rehab, outpatient rehab, and aftercare services? How many days of treatment does my insurance cover? Are prescriptions during treatment covered? Do I need pre-approval from my insurance company? With so many different insurance providers and plans available, the answers to these questions can vary greatly from person to person. Luckily, we’re here to help, Because We Care. 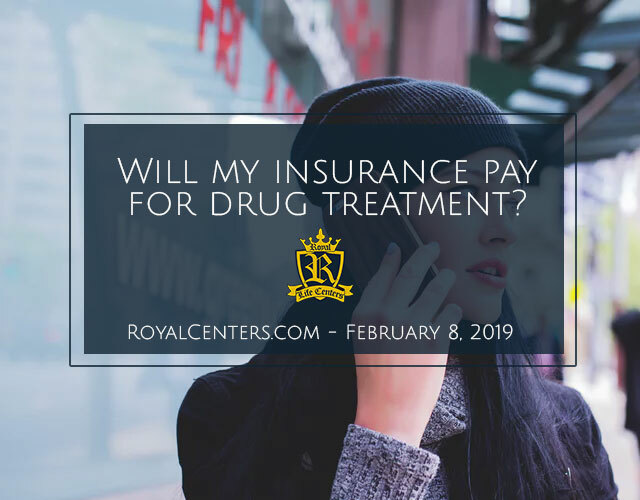 If you’re not sure that your insurance will cover addiction treatment at Royal Life Centers, we offer a no cost, confidential insurance benefit verification over the phone. It’s quick and easy as well as completely risk-free. You can also use our online form and someone from our admissions team will contact you shortly to review your insurance benefits and options. Don’t let misunderstanding your insurance benefits stop you from getting the addiction treatment you deserve. Call (877) 732-6837 today and speak with a Royal Life Centers addiction specialist.